1 – Rustic Romantic – This gorgeous coffee bar from Keurig Bridal combines the rustic look of wood with the romance of pastel pink florals. Dainty china cups are perched alongside modern coffee makers and other supplies, while a cutout coffee sign hangs from a fancy chandelier. 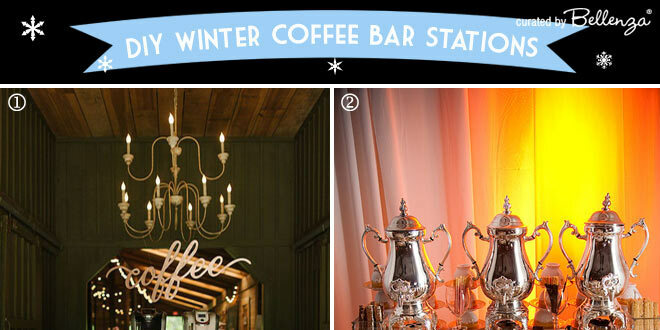 2 – Antique-inspired – Gleaming ornate coffee pots dominate the display in this coffee station from A Southern Soiree. 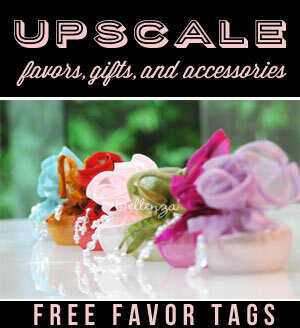 While the practical accessories and ingredients are arranged casually within reach, alongside stacked china cups. 3 – Organic Industrial – The industrial-style venue of this reception via Junebug Weddings (image: Unveiled Radiance Photography) set the tone for this coffee bar, with styro cups and piles of cookies on a simple table. 5 – Casual Chic – The crisp white of the table and serve ware in this coffee station from Fantabulosity creates a bright, cheerful look that’s so inviting. 6 – DIY Bar – Sincerely, Marie Designs (formerly The Tale of an Ugly House) shows how this rustic wood frame was built around an existing table and a self-painted chalkboard. 8 – Holiday Cheer – This simple setup from 1915 House makes lovely use of a star lantern and fairy lights for a festive take on a coffee (and hot cocoa) bar. 9 – Campfire-inspired – From Salt Lake Bride & Groom comes this campfire-inspired coffee station featuring a unique pour-over bar with vintage mugs and a spread of fresh fruit pop tarts and old-fashioned doughnuts rolled in cinnamon sugar. 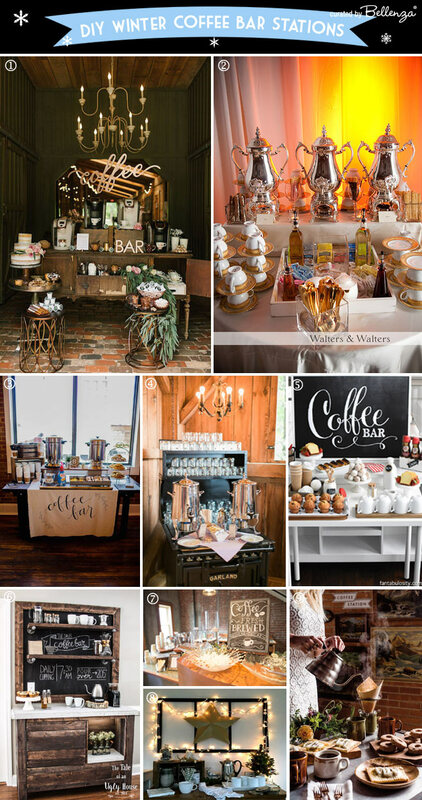 Tip #1 – Visualize what type of table or other furniture piece would allow your coffee bar to suit your wedding theme. Tip #2 – Keep in mind, too, the size you will need for setting up all the coffee paraphernalia and to fit your reception venue. Tip #3 – Look around your home for a likely piece that you already have, or borrow from a family member or friend. You’ll save a major expense that way. Tip #4 – Your next option would be to scour secondhand furniture shops, yard sales, and thrift stores. You may just chance upon a great bargain. Tip #1 – Call attention with a coffee bar sign. It’s always cool to have signage of some sort (even if the aroma of coffee will draw guests anyway!) 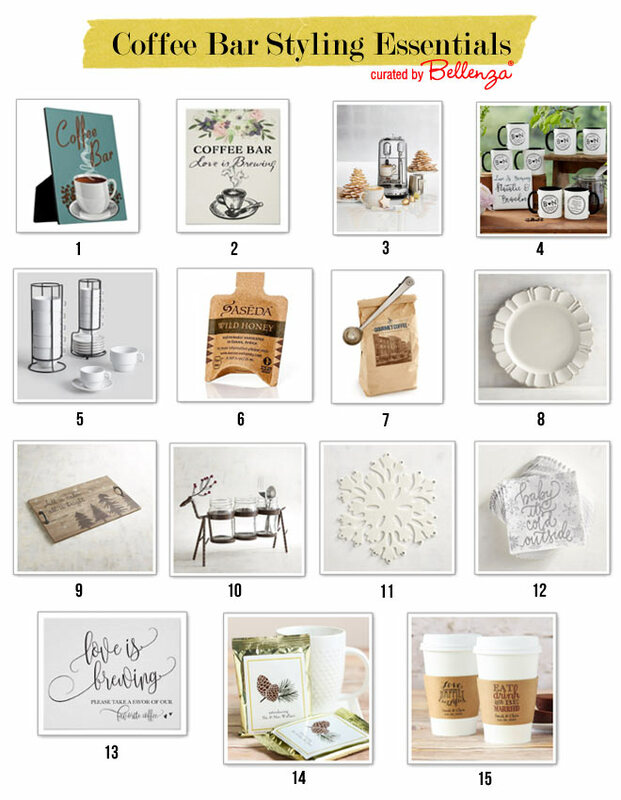 You could choose from a coffee bar standee-type sign (1) or one that says “Love is Brewing” with pretty florals (2). Tip #2 – Choose a coffee machine to suit the number of guests you will serve. When deciding on what coffee maker you need, ask your caterer’s advice for a large reception or invest in one yourselves for an intimate gathering – like this sleek Breville Nespresso Coffee Maker (3). Note: Don’t you love the stacks of star-shaped cookies in the form Christmas trees? Tip #3 – Prepare cups or mugs that suit your wedding theme and the available space. Have cups or mugs within easy reach for guests to serve themselves. You could opt for personalized coffee mugs (4) that double as wedding keepsakes, or space-saving stacking cups (5) that leave more room free. Tip #4 – Set out coffee accessories that are practical, convenient and stylish, too. Think essentials like sweeteners and honey in single-serve sachets (6), coffee scoops (7) that double as coffee bag clips (a pretty cool styling idea for your display! 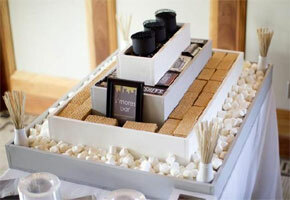 ), and winter-inspired serve ware like white charger plates (8) and wooden trays (9) for displaying food items on the coffee bar. For holding cutlery like spoons, forks and stirrers, why not a cute reindeer caddy (10)? And to play up the wintry look, include snowflake placemats (11) and “Baby It’s Cold Outside” party napkins (12). 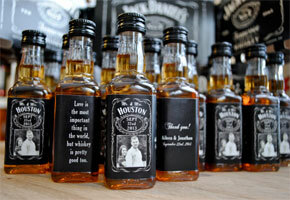 Tip #5 – Plan coffee-inspired wedding favors. Prepare a favor display with its own special sign (13) saying “Love is brewing – Please take a favor of our favorite coffee.” And in a basket, set out personalized coffee sachets (14) containing your favorite blend and personalized coffee sleeves (15) wrapped around styro to-go cups filled with treats. This is the perfect opportunity to serve special coffee blends inspired by the season! Just look at our finds from World Market. The names alone will have everyone humming holiday tunes over steaming cups of coffee! Option #1 – Home-bake your favorite goodies – maybe using treasured family recipes you’d love to share with your guests. Option #2 – Buy ready-made from a bakery or grocery, and arrange the treats prettily on cake stands, serving trays, marble boards, and tiered pastry stands. Option #3 – Have your caterer supply an array of traditional “coffee partners” like donuts, bagels, scones, cookies, pastries, biscotti, and “snowballs” which are actually Mexican wedding cookies – also known as Russian tea cakes. Next Easy Winter Bridal Shower Food: Guide to Yummy Recipes!